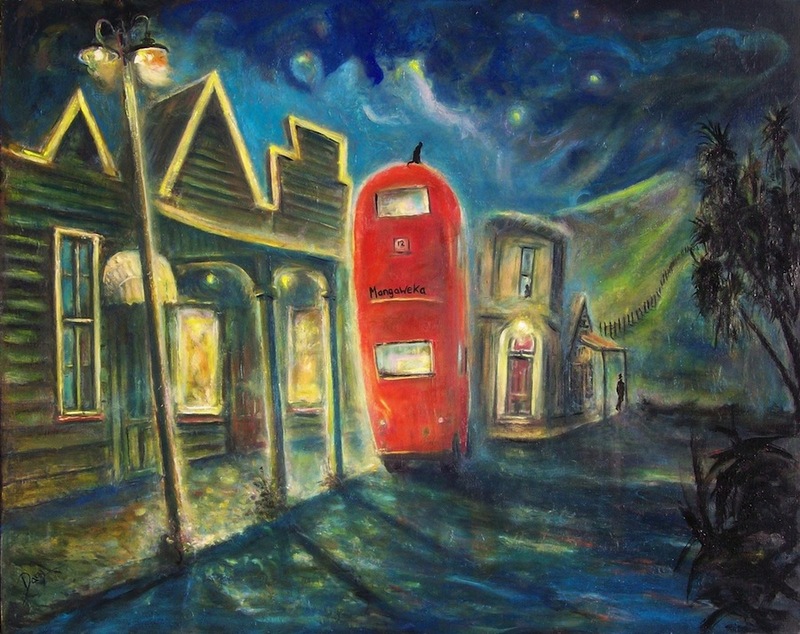 Mangaweka and The Red Bus Painting by Daryl Lex Price. Oils on linen 91.5x122.5x4cm Nov 06. NZ Mangaweka art 265. One of my surreal artworks of a favourite town, Mangaweka, in the middle of the North Island, New Zealand. As a kid we would stop in the main street of this old town (long since bypassed by the highway) on our occasional travels, crammed into the back of an old Vauxhall Velox car. I remember the waitress ladies in the 'tearooms' as they were called then, with their posh speaking voices, white aprons and bright red lipstick, as a five year old we had to be on our best behaviour in such a distinguished and exclusive eatery. People have asked," why the big red London double decker bus?" and admittedly it was not there all those years ago. I only saw it there in recent times but it kind of reminded me of those posh ladies practising their English accents. Memories aside, the place is still occupied by interesting people who care for and love the old town. Mangaweka From Wikipedia, the free encyclopedia Jump to: navigation, search This article does not cite any references or sources. Please help improve this article by adding citations to reliable sources. Unsourced material may be challenged and removed. (January 2008) Mangaweka Mangaweka's iconic DC-3 Mangaweka is a township on State Highway One (SH1), in the North Island of New Zealand, with a population of just under 200. It is between Taihape to the north and Hunterville to the south. The Rangitikei River runs adjacent to the township, which is popular for rafting, kayaking, fishing and swimming. The township is interesting not only for the visually interesting historic main street, but also because of its growing artists' community. The main street is preserved in its original state due to SH1 being re-located in the early 1980s. This tore the heart out of the township as the main street became redundant, but this is what makes the township such a tourist attraction today, with many people stopping to take photographs and visit the flourishing art galleries. The main feature in Mangaweka is an elevated DC-3 aircraft. It was originally set above SH1 as a tearoom, but is now featuring its history in New Zealand. There is also a busy cafe under the DC3 that acts as the base for a river rafting company. The Department of Conservation have several scenic reserve walks around Mangaweka including one on the former North Island Main Trunk railway line and tunnels, replaced by a deviation in 1981. Famous (or infamous) people who have lived in Mangaweka include the New Zealand poet Sam Hunt, the artist Robin White (whose iconic "Mangaweka" painting hangs in Te Papa) and photographer/artist Richard Aslett. The town also hosts the controversial annual "Fakes & Forgeries Art Exhibition and Festival" in October and November, which in 2007 featured Mangaweka's most famous son, C. F. Goldie (alias Karl Sim ). Other major features close to the town include some of the country's biggest railway viaducts , and the Rangitikei River canyon which provides the setting for the southern hemisphere's highest flying fox, 80m bungy jump and Lord of the Rings location.